Emily Bratcher is a writer and editor living in Chicagoland. Her love for design started a decade ago when she interned with an interior design magazine in London. Her own personal style is Scandinavian minimalism meets the Old Lucketts Store, a gem of a shop in Leesburg, Virginia. Spencer Ogden engaged Office Principles for the job of creating a sophisticated and funky branded office, which embodied its evolution as a company. A company in Reading, England charged AIS to create its new future-focused workplace in Reading’s Thames Tower. It wanted the design of the office to appeal to a creative workforce. To create an agile workspace, Ted Moudis Associates converted private offices to innovative meeting rooms. Wanting to create an employee-centric office, PARKA – Architecture & Design fashioned an office with a black-and-white color palette that fosters collaboration and creativity. 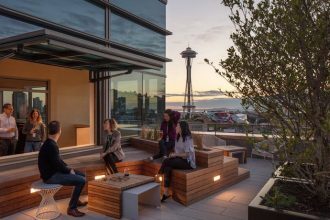 EarthCam’s new headquarters feature floor-to-ceiling windows and skylights that bring the outdoors in and provide natural light to the open, organic work spaces throughout the building.